We don't really pay much attention to the many well-being and health benefits of parsley. Like a lot of herbs (and spices) we know that they're tasty, and can enliven the most boring food. But often we don't take much notice of their well-being and health properties. ...It turns out that piece of curly leaf parsley (or flat leaf) may just be one of the best herbs for your health and well-being! ...By the way, this is one area where the health benefits of parsley are not proven. Unfortunately! 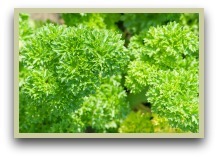 But current ongoing studies are finding proven uses for this often overlooked herb. One that may surprise; this herb contains more vitamin C than most citrus plants, almost three times more than in your average orange! Read more about the plant. For centuries, before the invention of mouthwash and toothpaste, it has been chewed to help freshen the breath and give a clean mouth feeling. The Chinese knew all about parsley benefits, and traditional Chinese medics still make a tea out of the fresh leaves to help regulate high blood pressure. I often make this drink just for the vitamin and minerals it contains. Click here for my homemade parsley tea recipe. Of course if you're planning on using it, whether for cooking or medicinal reasons, using the freshest stuff you can is best. Therefore growing it may be a good idea. 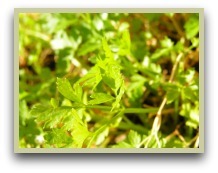 Read more on growing parsley.